Bonnefont: "We have no plans currently to go into the U.S., but it is difficult to be a premium brand without being present in the U.S. market. It would be crazy to say no forever to the U.S."
Yves Bonnefont made history this month. On June 1 he became the first CEO of PSA/Peugeot-Citroen's upscale DS brand. PSA's former director of group strategy is now tasked with elevating DS from a tiny-but-successful division of Citroen to a global powerhouse -- while further boosting profitability. 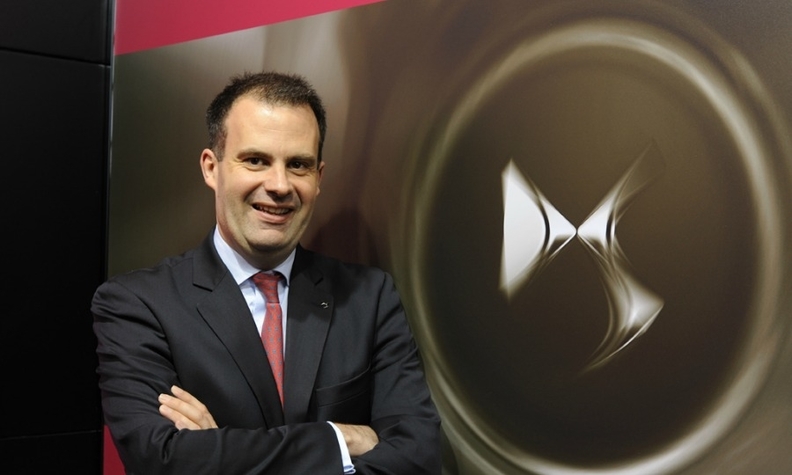 Bonnefont, who rejoined PSA in 2012 after working as a management consultant, shared his plans for DS in an interview with Automotive News Europe France correspondent Bruce Gain. DS is a stand-alone brand in China but in Europe it is a division of Citroen. How will DS become more independent? In Europe, the success of DS would not have happened without Citroen. To exist in a market as large as Europe you need a very large dealer network, which Citroen has, so it would be crazy not to leverage this. We want to increase the visibility of DS throughout the network worldwide. In Europe, DS’s only stand-alone dealership, DS World, is in Paris. What are the other sales models you use? We have three formats for the DS line at Citroen dealerships in Europe: the DS Zone, DS Salon and DS Store. The DS Zone is simple, just a black floor with some special lighting. DS Zones are in place in 85 percent of our dealerships in Europe. A DS Salon has three or four models displayed on a dedicated floor space and there is a DS salesman. There are also DS signs outside of the dealership. It is not very different to Infiniti’s strategy. And, we have two variations of DS Stores, one that is very close to what Infiniti has with dedicated entrances and a wall separating DS and Citroen models. MAIN CHALLENGE: Making DS a successful stand-alone global brand. Which of the three is preferred? Our No. 1 objective is to develop the DS Salon in Europe. We believe it offers a good DS experience and it can be rolled out relatively quickly. Today, we have 12 DS Salons in Europe that are fully operational. There will be 40 DS Salons in Europe by the end of 2014. We will continue to develop this format throughout Europe. We will rely on DS Salons for the next five years, but I don’t want to give out figures because we are still working out how many we need to cover Europe. I am not looking at the world by countries; I am looking at the world by cities. We have found that a lot of the growth in the premium market is happening in a relatively limited number of cities around the world. There are about 500 cities in Asia, Latin America, Europe and the United States that will account for the vast majority of growth in the premium market. Our strategy is to develop a first wave of [dedicated DS dealerships] in 200 of those cities to drastically increase the visibility of DS. Are you looking seriously at the U.S? We have no plans currently to go into the U.S., but it is difficult to be a premium brand without being present in the U.S. market. It would be crazy to say no forever to the U.S.
What is the average profit margin for DS models and how does this compare with Citroens and Peugeots? We do not communicate profits by brand, but I can tell you that DS is already profitable. Of course, we want to make it more profitable and develop the brand. While premium cars represent about 12 percent of car sales worldwide, they represent about 45 percent of the industry’s profits. There is no reason why we should not aspire to be on par with this kind of sales-to-profit ratio. It is a reasonable benchmark. How many DS models were sold in Europe last year and what is the forecast for this year and beyond? We sold 120,000 units in 2013. Last year, we remained Euro-centric, with more than 85 percent of our sales in Europe. Our target is to sell 50 percent of our cars outside of Europe by 2016. We don’t give forecasts, but we are accelerating our efforts to grow our sales outside of this market. It is good to be successful in Europe, but we don’t want to be stuck. How many of DS buyers in Europe are conquests and from which brands? Today, 62 percent of our sales are conquest sales and about 85 percent of them choose between buying a DS or a model from another premium brand. These are previously mainstream car customers who want to buy a premium car. The main competitors are the top German brands and certain Italian premium brands. No, so you can draw your own conclusion which brand it is.